We've been testing this kit on our shop B7-RS4 for over a year and have even installed a few kits for local customers. Now that we've finalized the kit for production, we're ready to sell it! At JHMotorsports we have had first hand experience with failed OEM Oil Lines on our shop B7-RS4 and several of our customers' RS4s. The stock oil lines are incredibly thin and aren't very durable at all. In combination with these factors and they way they are routed from the factory, the stock oil lines are prone to failure. We've seen everything from worn lines to the point of fraying all the way to complete failure and puncture leading to nearly a total loss of all oil in the motor. Notice how thin the stock oil line is. There is barely a thin rubber layer surrounding a very rough and ridged inner plastic lining - which is also incredibly thin! When compared to the new, upgraded -12AN JHM lines, the advantages are clear. Our lines have a thick and sturdy rubber layer that is almost five times the thickness of the OEM rubber lining and over two times as thick as the OEM rubber and plastic lining combined! Not only that, but the JHM Upgraded Lines feature a smooth inner surface where the oil flows through allowing for less resistance in oil flow. Not only does this kit address a weak and faulty component of the B7-RS4 Motor, it also has the added benefit of converting your oil lines to -12AN. On top of all this we engineered them to have more ground clearance than the OEM oil cooler lines. 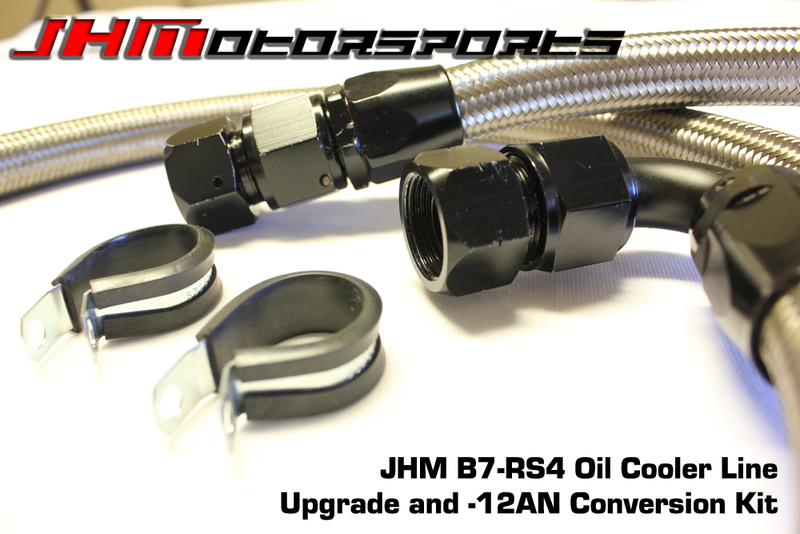 JHM has made a pair of custom adapters that convert the stock oil line fittings to -12AN sizing. 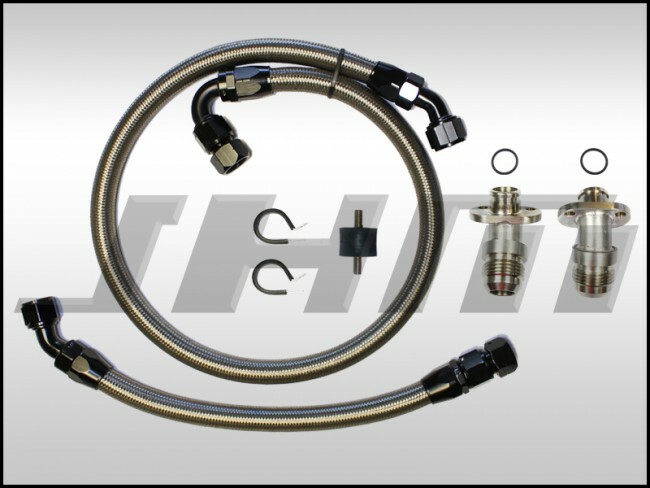 This allows you to have the ability to upgrade your RS4 to an aftermarket, upgraded oil cooler core down the road. Here at JHM, we have been testing a few different cooler cores on our shop B7-RS4 and others and have found minimal to no gains over the last few years. This is due to the fact that the factory oil cooler core performs quite well for most weekend road course warriors. NOTE: We have made these oil lines specifically to fit the location and size of the stock oil cooler. These lines may work with cores in different locations or in different sizes if you modify the routing and/or the routing of the lines. We assemble the lines here at JHM, so if you are interested in custom length oil lines, give us a call and we'll help you out. If your stock oil lines wear out, are rubbing through, or have completely failed DON'T GET STUCK IN THE CAGE OF USING ONLY OEM PARTS. As of the release of this kit, OEM RS4 Oil Cooler Lines retail for as much as $375 and $275 EACH! Even the generic parts "warehouses" sell these lines for $364.70 and $267.45. That's over $630!!! Don't buy OEM lines again and restrict yourself to only using OEM parts. 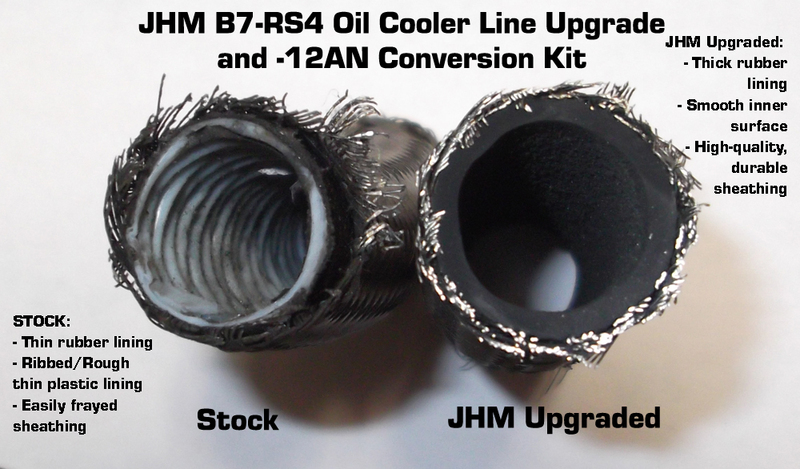 Buy the JHM Upgraded Oil Cooler Line Conversion and Upgrade kit and give yourself the freedom to run the OEM Oil Cooler or upgrade to another cooler down the road!